iPhone 6/6 Plus is frozen? What’s more, your iPhone frozen and won’t shut down. Don’t worry, in this article, you can learn how to reboot a frozen iPhone 6/6 Plus. In the following, I'll tell you 3 ways to fix a frozen iPhone 6/6 Plus. You can also use these ways if your iPhone 6/6 Plus stuck in recovery mode during iOS 8/9 update. Restart your iPhone seems to be an omnipotent trick to solve most problems we meet on the first try. In fact, it also applies to this situation .Restarting your iPhone will solve the freezing issue and complete the iOS 8/9 update. 1. Keep pressing both the “Home” and the “Power” button until the Apple logo comes back on again. 2. Then release both buttons and your iPhone should boot up successfully. 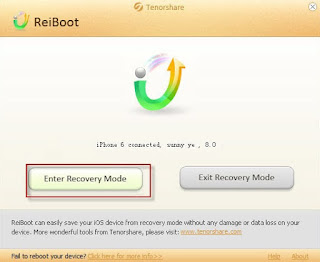 Reboot your iPhone with Reiboot is also an effective way to fix frozen iPhone 6/6 Plus without data loss, especially when your iPhone Home or Power button is broken. 1. Download the Free Trial Reiboot Software. 2. Connect your iPhone to PC and launch the free iPhone reboot tool. Reiboot will detect the condition of your iPhone automatically. 3. 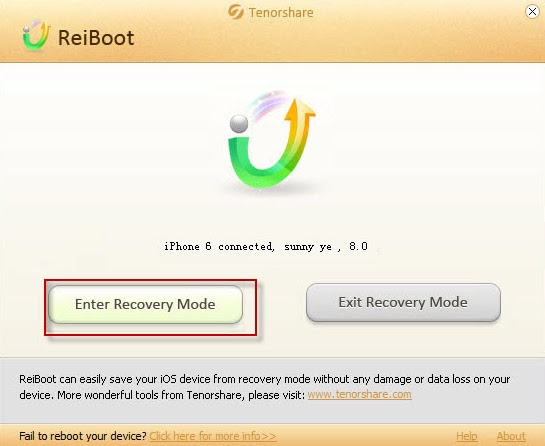 Click "Enter Recovery Mode", "Exit Recovery Mode" or use both according to the detecting result to reboot your iPhone. Still can’t fix your frozen iPhone? In this case, you have no choice but to restore your iPhone to factory settings. What’s more, you must make sure you've backed your iPhone up before restoring .Because this operation essentially restores your iPhone to factory settings. Good luck! Hope can help you, more ways to reboot a frozen or hung iPhone!